Get more from business with a walk in freezer North Shore businesses will envy. United Service Co. has served the area since 1953. Your walk in freezer is a crucial component of business. It keeps foods and other items at low temperatures for enhanced preservation. Whether you run a wholesale seafood business or a hospital cafeteria, our team will help you make the most of your walk in freezer in North Shore. Our turnkey business offers design, build, installation, and ongoing service support to help you maintain business performance. Call us today. If you’re searching for a new walk in freezer or services to support your walk in freezer in North Shore, consider the benefits of working with United Service Co.
We’re family owned and operated. For more than six decades, our family has maintained a commitment to local businesses. We understand our customers’ bottom lines ride on consistent uptime. Over the years, we’ve built a reputation for success for our emergency services and end-to-end support. If you have questions about a walk in freezer in North Shore, ask us. We’re your go-to commercial resource for refrigerated equipment including freezers, coolers, and ice makers. We guarantee customer satisfaction. If we do something wrong, let us know. We want to make it right and earn your business for years to come. As a Better Business Bureau accredited business, we’ve made a public commitment to resolve complaints in good faith. We want to make sure you walk away happy with the services we offer, whether you’re a first-time customer or a veteran. We have experience. Cumulatively, our technicians bring 100 years of experience to work with them every day. You won’t find a more knowledgeable team of experts elsewhere. If you have a walk in freezer in North Shore, you can count on our licensed, trained, and EPA-approved team to get the job done the right way. We offer emergency services. You can’t predict when your walk in freezer in North Shore might go on the fritz. We offer 24/7 emergency support to help you avoid significant product losses. Our technicians work on most major refrigeration equipment so you can greet your customers with a smile any day of the year. A day without freezer capabilities can ruin thousands of dollars in product. If you’re tired of worrying about uptime concerns, partner with a company that cares about your business outcomes. 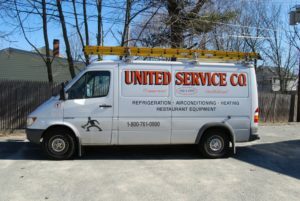 At United Service Co., we look forward to serving as your go-to partner for HVAC, refrigeration, and appliance repair work. Allow us to help you build a reputation for success here in the Northeast. For more information about new designs and services for a walk in freezer, North Shore company representatives can call (800) 761-0900 or (978) 750-5600.